The path toward audio nirvana is not formed by a single route, but by several frequently divergent roads. One road, all but abandoned decades ago then recently rediscovered, demands that all signal gain stages be accomplished by the simplest of circuits using vacuum tubes in a single-ended topology. This type of amplifier design has acquired a reputation for realistic sound quality, purely musical output, and holographic imaging that its proponents value greatly. However, using a two or three watt, single-ended triode (SET) amplifier for music playback presents a considerable challenge. That is, which speakers can be used to deliver the desired sound quality while still providing sufficient headroom for reasonably effective dynamic range? Low-powered, SETs sound worse than anemic when asked to drive typical, low-efficiency, multi-driver speakers or mini-monitors to a satisfactory volume level. Speakers with higher than average efficiency ratings are required to resolve this problem. Unfortunately, high efficiency loudspeakers generally have been somewhat eccentric and very expensive. However, affordable, high-efficiency speakers are now becoming relatively common. Since reasonably-priced, low-powered, vacuum tube amplifiers now seem to be everywhere, the proliferation of compatible speakers is quite welcome. High-efficiency speakers commonly have been transmission line or horn-loaded, single-driver designs. While efficiency is very high with these types of speakers and musical presentation is often superb, elaborate cabinet construction requires extensive labor and is very costly. This type of speaker design is still available, frequently using Lowther drivers, and can cost thousands of dollars for the cabinets alone. Besides the high purchase price, many of these speakers are so visually dominating that placing them in ordinary living spaces sometimes presents problems. The newest generation of affordable, high-efficiency loudspeakers are usually under $1,000, but, in order to reduce costs, some compromises must be made. Most examples sacrifice some efficiency to keep the price down. For instance, the Hornshoppe Horns are rated at only 92dB efficiency, and the Moth Audio Cicadas are rated at 94dB; in contrast, many Lowther-based designs have rated efficiencies well over 100dB. Some of the recent high-efficiency speaker designs, including the Cicada and Loth-X, use bass-reflex cabinets, a design that has the advantage of simplicity and inexpensive construction. However, if not properly implemented, it can have the disadvantage of sounding like a 'box'. While low-powered, SET amps require high-efficiency speakers, preferred designs usually use a single, full-range driver. Why are single-driver speakers often favored? After all, a full-range driver must carry the entire frequency range from low to high, which is a very difficult task. It is much easier for multiple drivers to cover the audible spectrum. Proponents of single-driver loudspeakers claim that such designs have distinct advantages for the reproduction of music. Multiple drivers must be controlled and interfaced by a crossover network, whether passive or active, while a single-driver loudspeaker lacks any type of cross-over. It is also believed that additional components in the signal path may alter the audio signal. In addition to interfacing the multiple drivers, crossover circuitry must be used to correct phase inconsistencies between the drivers. High quality speaker builders, such as Spendor and Reynaud, expend considerable time and effort to assure proper phase alignment so that pace, rhythm, and timing will be accurate and musically correct. These characteristics seem to suffer greatly when drivers are not properly phase- and time-aligned, a problem single driver speakers do not suffer. In addition, without a crossover interrupting the frequency range, there can be a greater sense of coherency, particularly in the all-important midrange. Omega Speaker Systems is a new company that exclusively builds loudspeakers. The goal of the company, as stated on their Web page, is "...to engineer and manufacture loudspeakers which faithfully recreate music the way it was intended." The design of the TS line of speakers is characterized by the use of a single, Fostex, full-range driver in a bass-reflex cabinet. Omega loudspeakers are not very large, they are generally regarded as 'bookshelf' sized. The Fostex drivers used in the TS line are the FE-E series of full-range drivers, which have specifications more suitable for use in bass-reflex cabinets than the FE-Sigma line of drivers. In addition, all drivers used in Omega's line of speakers are shielded, which allows safe placement near television sets or video monitors. This series of Fostex drivers uses lightweight, paper cones and treated cloth surrounds. Omega Speaker Systems modifies the drivers to dampen the back wave and improve bass response. By using proprietary modifications and alignment, Omega is able to get better bass out of smaller cabinets reducing costs and keeping retail prices low. Large diameter, full-range drivers are notorious for 'beaming' high-frequencies into a relatively small area resulting in a tiny and limited 'sweet spot'. Imaging and musicality suffer when the listener moves away from the sweet spot. Whizzer cones are often employed to disperse high-frequency sound energy and improve off-axis frequency response and sound quality. The two larger speakers in the series, the TS1 and TS2, use drivers with whizzer cones; the TS3 uses a smaller driver that has no whizzer cone. Omega Speakers Systems currently produces three basic models of the TS, or 'True Sound' loudspeaker. All three are available in 'Standard' and 'R' models; the 'R' models add a few premium features to improve loudspeaker performance compared to the Standard. The TS series of speakers is offered with seven speaker finishes. Finishes are available to complement nearly any decor. They range from light-colored, conventional finishes such as natural maple and cherry veneer to Blue Arctic and Black Maple Pearl, which is a very dark, laminate finish that is difficult to describe and beautiful to behold. 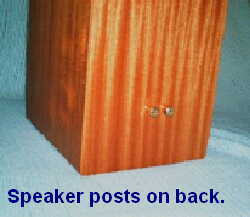 Three examples of Omega speakers were available for inspection. All had flawless finishes that would complement high quality furniture. These speakers do not look cheap. What is the Model TS2R? The TS2R uses a Fostex FE167E, 6.5-inch, full-range driver mounted in the upper half of the front baffle. The whizzer cone of this Fostex has rolled edges, a design that is supposed to reduce whizzer cone sonic problems such as the infamous upper mid-frequency 'shout' of some whizzer cone equipped drivers. The Fostex driver in the Omega TS2R has a rated efficiency of 94dB/1 watt/1 meter at 8 ohms nominal impedance. The frequency response of the TS2R is listed as 58Hz to 20KHz. The single, 2-inch, tuned port is located in the lower half of the baffle. Cardas Patented Silver binding posts are placed on the back of the speaker. Thankfully, they are not in a recessed cup, but are mounted directly on the back of the cabinet. This design makes connecting speaker cables much easier compared to cup-mounted posts, especially during periods of frequent cable and/or speaker swaps. Internal wiring uses Cardas Litz wiring and, naturally, there is no crossover network. The TS2R is about the size of a typical mini-monitor: 40.6cm high (16 in. ), 21.6cm wide (8.5 in. ), and 26.7cm deep (10.5 in.). At 8.1 kg each (18 lb), the TS2R is a solid, sturdy, and dense little loudspeaker. The cabinet of the TS loudspeaker is constructed of 3/4-inch (1.9cm) softwood MDF with ladder bracing, semi-floating baffle and rear panel, and it uses acoustic foam, fiberglass, and Black Hole 5® (acoustic damping material) to damp standing waves and cabinet resonance. In addition, the 'R' model uses a 1/4-inch (6mm) layer, asphalt/vinyl composite adhered to the cabinet to further damp cabinet resonance. The TS2 line is veneered on all sides and uses double veneer on front and back. The cabinets were constructed like fine furniture with excellent fit and finish. The finish on the sample TS2Rs was a flawless, natural, oiled Sapele. The driver and plastic tuning port were secured to the baffle with round-head, brass screws. 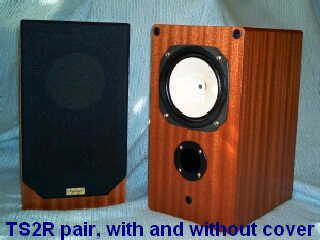 A black speaker cover can be used to cover and protect the driver and enhance the appearance of the TS2R loudspeaker. The cover is easily removable for serious listening sessions. How Does the TS2R Sound? As with many single-driver loudspeakers, one of the greatest strengths of the Omega TS2R loudspeakers is a quality that is somewhat more difficult to attain with multiple drivers - the pace, rhythm, and timing of the Omega seems spot on. Listening to the exotic and complex rhythms of Benise's new CD, Mediterrania was a positive and delightful experience, even after having heard the same music in live concert only hours before. There was no impression of dragging, or overhanging notes or transients. The various percussion instruments sounded quick and solid with perfect timing. This allows the Omegas to have a musically honest sound, something that many competitively-priced, multi-driver loudspeakers have difficulty achieving. The TS2R also does a very good job of reproducing fine musical detail. However, unlike some high-end loudspeakers, the TS2R does not seem to emphasize fine details to the detriment of the overall presentation. While the TS2R is rated to 20KHz, there is an aural impression that the high frequencies are slightly rolled off when comparing them to a pair of B&W DM602 speakers, but the B&Ws can often seem somewhat bright with a bias toward the upper end. However, when comparing the Omegas to a pair of Reynaud Twins, the highs didn't sound rolled off, but instead seemed well balanced with the rest of the audible spectrum. When listening to the TS2R, high frequencies are clean and clear without being harsh or overly bright. If the speakers are toed-in, there is a tendency toward excessive sibilance, but with the speaker toe-in properly set, either very slight toe-in or none at all, the sibilance is much less noticeable. High-frequency transients are sharp and quick, providing realism that is sometimes lacking in similarly-priced loudspeakers. Sustained notes and note decay are smooth and clean; cymbals sound like cymbals, triangles sound like triangles. These may seem like simple, easily achieved sonic goals, yet the number of loudspeakers that fail to accomplish such simple tasks is surprising. The quick transients and clean, high-frequency tones allow the Omegas to reproduce music from acoustic instruments with clarity and authority. While the Omega TS2R was unable to match the high-frequency performance of some similarly-priced speakers, this only impaired its 'hifi' capabilities, not its ability to reproduce music. The TS2R reproduces vocals with proper tone and realism, sounding neither forward nor recessed. This allows the most expressive of musical instruments, the human voice, to carry multitudinous messages, subtle and overt, from the artist to the listener. Female vocals are particularly engaging. Whether listening to the ethereal vocals of Mary Black or the smoky jazz of Patricia Barber, the TS2R reproduces female vocals with delicacy and detail. There is no nasal coloration, and no boxy sound to interfere. Male vocals work nearly as well, from the eccentric baritone of Leon Redbone's Up a Lazy River to the extraordinary tenor of John Gary. The RCA Living Stereo LP Harry Belafonte Live at Carnegie Hall has long been a favorite of mine for simply enjoying a musical performance, and the little Omega speakers do not disappoint, bringing out all the expected nuances of Belafonte's performance. The TS2R frequency response is rated from 58Hz to 20KHz, which is not significantly different than similarly-priced, multi-driver loudspeakers. My listening room is notorious for soaking up bass, leaving some speakers straining to achieve a low-frequency that is 5 to 10 Hz above their lowest rating. This was not so with the TS2R. Bass was strong and deep, reaching below 60Hz, even in my listening room. More importantly, bass was clean, and bass transients were quick and accurate. Though bass transients were not as quick as some speakers, including Omega's own TS3, there was no overhang. With sufficient power, complex bass passages sounded detailed and accurate. How much power is enough? With an efficiency rating of 94dB, as little as 3.2 watts per channel from a 2A3-powered Fi X amplifier could drive the Omegas to a volume above my normal listening level with no apparent loss of bass detail or control, even on complex passages. The simple rhythms and simplistic percussion of rock music were no challenge for the Omegas. More complex rhythms were easily handled with grace and accuracy, including the lively and driving Bridge of Sighs from Benise's new Mediterranea CD, and the eery Night on Bald Mountain by Mussorgsky. However, since the TS2R cannot reproduce frequencies much below 60Hz with any authority, a subwoofer will be needed to fill in deep bass. One of the most significant aspects of Omega's TS2R is its flexibility with regard to amplifiers. Many single-driver speakers are horn-loaded, and, often, horn-loaded speakers have a 'preference' for tube amplifiers, particularly single-ended triodes. However, the TS2Rs sounded very good whether using a 110 wpc, solid state BV Audio PA300 amplifier or a Fi X 2A3 single-ended triode. In addition, the high-efficiency allowed low-powered amplifiers to attain adequate volume for excellent performance. Numerous combinations were tried, including a short time with a Dynaco ST70 (before a tragedy befell its Mullard GZ34), a BV Audio PA300, a Decware SE84C-Select, a Fi X, a nOrh SE9, and a pair of nOrh Le Amps. Regardless of the amplifier used, the TS2R performed beautifully, providing a musical presentation that was delightful and captivating. My favorite combination with my front end equipment and in my listening room was the Decware SE34-I using only one output tube per channel in pseudo-triode mode. That combination had very nearly the detail and superb imaging of the little SE84C-S, but with more power and richer, better defined bass. The PA300 also worked extremely well, providing a level of bass sharpness and control that the SE34-I couldn't quite match, although the PA300 sometimes sacrificed a little sound quality in the high frequencies. The Omega TS2R loudspeakers were capable of excellent, pinpoint imaging, provided suitable sources and amplifiers were used. The best imaging during the testing was observed when using a Dynavector DV20X cartridge, a Decware ZTPre preamp and SE84-CS power amp connected to the Omegas by a pair of Zero Autoformers with impedance divided from 8 ohms to 2.7ohms. Each instrument was cleanly and clearly separated from all others in 3-dimensional space; there was a surprising amount of 'air' between the instruments. Front to back instrument locations were as clearly defined as left to right, although the soundstage wasn't particularly deep compared to some loudspeakers. Excellent stereo imaging was quite noticeable with many recordings, including some CDs, but it was most pronounced with the Arco Iris Peace Pipes LP. The small cabinet size makes the TS2R easy to move and relocate, and the bass-reflex design allows easy placement in most rooms, at least compared to some horn-loaded loudspeakers. For best bass reinforcement and to prevent high frequency absorption by floor coverings like carpet, the little Omega speakers need to be placed on stands. Placement in my listening room seemed best when the speakers were on stands about 2 feet (60cm) high, away from room corners, about 1 1/2 (45cm) feet from the back wall, and with little or no toe-in. 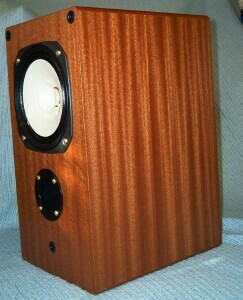 Side of TS2R cabinet showing beautiful grain of natural sapele finish. The fit and finish of the TS2R speakers was literally flawless. The cabinets were solid and dense with perfect corner seems. The veneer was applied so well that it appeared to be made from sapele wood, rather than veneered MDF. Of course, if it were solid sapele, there would have been more cabinet resonance that would have reduced the sound quality of the product. The TS2R driver, like the Moth Cicada and Lowther-based speakers, uses a whizzer cone for high frequency dispersion. This is not a bad thing in itself, because without the whizzers, full-range drivers as large as those in the TS2R would 'beam' high frequencies into a narrow area producing a tiny sweet spot. Some whizzers can be very bright or very harsh with improper toe-in (Cicadas), and most Lowthers are infamous for an upper mid-frequency 'shout' that is usually blamed on the whizzers. The TS2R also suffers from minor whizzer related problems, though not to the extent of Cicadas or Lowthers. 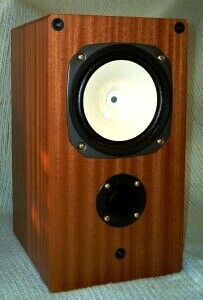 In my listening room, the TS2R speakers sound best with little or no toe-in. If the speakers are toed-in so they are pointed at my listening position, highs are a bit overwhelming - usually not raspy, harsh, or 'shouting', just a little too intense sometimes resulting in excessive sibilance. Naturally, this effect is going to vary according to the listening room and could be problematic in a very 'live' room. In addition, the whizzer brightness might be accentuated by solid state amps into a somewhat harsh sound. This was noticeable with the Le Amp monoblocs, but not with the BV Audio PA300. During testing, the soundstage when using the TS2R loudspeakers was usually limited in depth compared to some other speakers. While some speakers seem to have a soundstage that can be deeper than the limits of the room, the Omegas had difficulty accomplishing this. Again, this can easily be a problem with the acoustics of my listening room. This reduced soundstage depth had no significant effect on the Omegas' ability to produce stable, 3-dimensional images. One important thing to keep in mind, however, is that effects such as 'soundstage' and 'stereo imaging' are fun aspects of two-channel audio, but are unnecessary to the enjoyment of music. Omega Speaker Systems has entered the crowded loudspeaker market with a product that appears to be conventional, yet is not. Despite the appearance of a standard mini-monitor, the TS2R is a high-efficiency loudspeaker that provides the owner of low-powered tube equipment with another suitable, affordable, and very welcome choice. In addition to very good sonic qualities, the TS2R breaks tradition with many other inexpensive single-driver loudspeakers and has the appearance of fine furniture with a variety of available finishes. Most high-efficiency speakers in the price range of the Omega TS2Rs have eccentric designs, questionable finish quality, or no variety of finish types and colors. The Omega offers several available finishes that are done in excellent quality, which will allow them to fit into a wider variety of decor and make them more acceptable to a non-audio enthusiast residing in the same household (usually a wife). Laugh if you will, but the WAF (wife acceptability factor) is very important in many households. That the Omega TS2R is finished like fine furniture would be irrelevant if it was not capable of high quality audio output. To this end, the TS2R delivers. It has a clean, musically honest presentation that is neither overly bright nor dark. It has very good detail, but is not so detailed that poorly recorded music becomes intolerable. While the Omegas cannot quite match the frequency response of some, more conventional, multi-driver loudspeakers, they provide excellent tonal balance and smooth frequency response. Equally important, the TS2R has been designed to complement low-powered tube amps, yet still functions very well with high quality solid state gear. In the end, the Omega TS2R seems not to have been designed to satisfy the "sonic perfection" sought by audiophiles, but rather, it seems to have been designed to appeal to music lovers that appreciate a finely-crafted product. While there are several choices in the price range of the Omegas that produce equally musical sound, the combination of high quality sound and wonderful finishing choices is unique and very much appreciated. Many thanks to Richard for all the work involved, and TNT for giving me the opportunity to have the TS2R reviewed. It's been an absolute pleasure. I would like to express my appreciation to Louis Chochos, president of Omega Speaker Systems, for providing background information and the speaker samples used in this review.